Summer calls for lots of water activities, cool treats, and easy low prep activities like these summer dot activity printables. With minimal prep required, this is a quick and easy activity to set up for your kids. This Summer Dot Activity set includes six black and white worksheets: bucket of sand, flip flops, beach ball, ice cream cone, sun, popsicle. 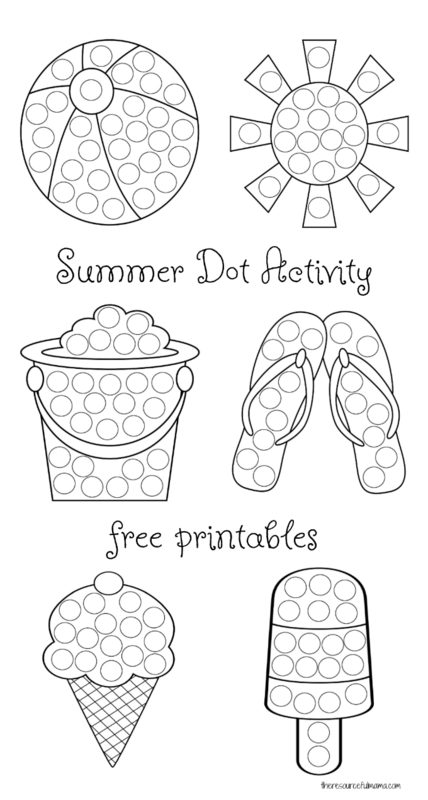 Download and print these summer do a dot worksheets on regular 8 1/2 x 11″ paper. We often use Do A Dot Art! Markers for dot activity sheets, but I love all the ideas shared by readers including pom poms, stickers, bingo daubers, and more! I especially love using dot stickers when you are on the go or need a quiet activity at a restaurant or doctor appointment. Do A Dot Art! Markers for dot activity sheets, but I have been blown away by how all of you use these dot activity worksheets: pom poms, stickers, bingo daubers, and more! I especially love using dot stickers when you are on the go or need a quiet activity at a restaurant or doctor appointment. These dot painting worksheets offer several benefits to kids and students. Besides being mess free, dot painting also helps kids develop hand-eye coordination as they direct their marker to the spot on their paper. Kids strengthen fine motor skills as they hold the dot markers and move their hands to apply the marker to the paper. Do A Dot Art Markers, are especially great for little ones. They are chunky, making it easier for their little hands to easily grab and manipulate. We love hearing and seeing how much you are enjoying our dot activity worksheets, tag us in your photos on Instagram, Twitter, and Facebook.